I like everything about this watch so much so, that I bought it in gold tone and rose tone also. Great look, fit, price and delivery. 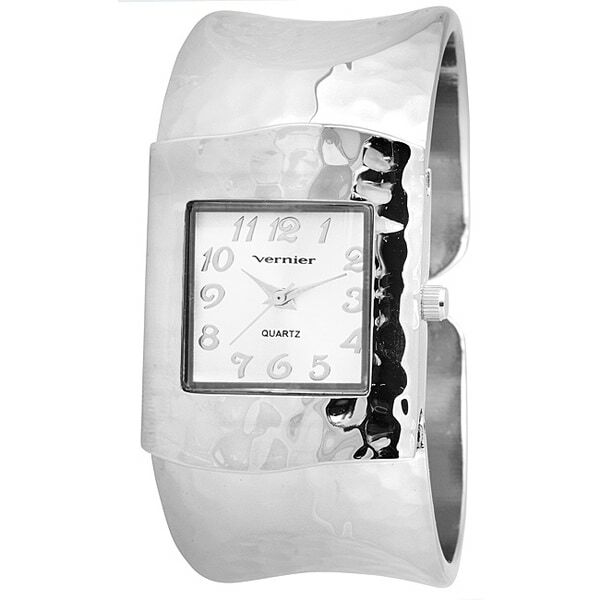 Simply elegant, this Vernier watch makes the perfect accessories for women young and old. This bangle watch displays the time on a beautiful, square, pink mother of pearl dial. Set on a brilliant silver-toned bangle made of brass with a hammered texture, this watch is water resistant up to 30 meters. With a hand for the seconds, minutes and hours, this watch will tell you the time accurately. Most women's watch bands can be sized to fit 6.5-inch to 7.5-inch wrists. This is an outstanding deal! The watch is beautiful as well as comfortable to wear. Good for dress-up or casual and quality made. My husband is a custom jeweler, and I can't believe what a beautiful piece this is for the money. Highly recommend ... you won't be sorry! The watch is a clean, modern style, but the hammered finish keeps it from looking utilitarian. The face is beautiful and simple. The effect is of a timepiece costing somewhere between $100 - $125. Box was fine, but nothing special. Again, what you'd expect if you spent about $100. Since I spent about a third of that - I'm very pleased. I like the watch and it is very attractive. It is a little small..my wrist is not very big and it fits but tight.. I absolutely love this watch! It's very stylish and works great. Definitely would recommend. footnote: If you have large wrists this watch will probably not work for you. Great watch pictures are accurate. Watch runs a little small. This will be getting returned, it's pink, not "silver toned". I really like the way this watch highlights an outfit. I may be 69, but I appreciate a new and different look with a kick! The wrist is a little small but I can wear it! This watch is beautiful! I bought it as a Christmas present for my daughter, and when I saw it, I ordered another for myself. Like everyone else, I would hesitate to buy one if your wrist is large. Hope it keeps time also since I don't intend to wear mine until Christmas when I give my daughter hers, but if the quality of the timekeeping is like the outside of the watch, there should be no problems. This is the same watch as the gold tone one. They are both great! This watch is easy to put on and take off. It kept time perfectly, and did not tarnish or fade. This watch helps to dress up any outfit. It matches well with several pairs of earrIngs that I also purchased from Overstock. The hammered bangle is very fashionable. Gorgeous watch. I get a lot of compliments when I wear it. This watch is beautiful and very wearable while also being a dramatic, eye-catching piece. Love it! Happy to find this hard-to-find bangle watch! Looks like a piece of fine jewelry and I get many questions and compliments about it. Looks lovely, being petite, bangle watches and bracelets flop on my wrist, these fit perfectly. Loose enough to be comfortable, but not to turn and flop. This is just as beautiful as it is pictured! My only problem with it is I find it heavy on my wrist. If you don't mind something a bit weighty you will love it! It can be dressed up or down. It looks just like the photo. "The description says that the watch is pink? It looks white in the picture. Is the actual watch background pink, the numbers pink, the hands pink or any part of this watch pink? Thanks!" Wanted the silver one when I saw the gold one. "hello! I'm wondering if you guys will be bringing in more stock for this piece any time soon? thanks so much!" Hello manru87, Items are restocked as they become available; however we cannot guarantee an Item will be restocked. Thank you for shopping with us. "Does this watch have a clasp on the back?" no clasp. It hinges on both sides and has a gap of about 1/2 inch in the back. Like a cuff bracelet.